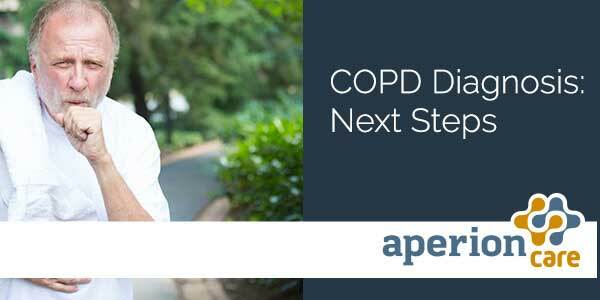 COPD stands for Chronic Obstructive Pulmonary Disease. It is a chronic and progressive condition that makes breathing difficult. COPD is caused most often by smoking, but can be caused by any prolonged exposure to lung irritants like dust, air pollutants, or chemical fumes. People suffering from COPD experience coughing fits that often produce excessive mucus and difficulty breathing. The condition has no cure, and worsens over time, but there are some lifestyle changes people diagnosed with COPD can make to slow the progress of the disease and make breathing more comfortable. Consult your doctor before making any changes to your diet, medication, or lifestyle. For our guests diagnosed with COPD, pneumonia, aspiration pneumonia, asthma, or ventilator dependency, a number of Aperion locations offer complete care for advanced respiratory needs, including Ventilator Units and Tracheostomy Care. Contact your local Aperion Care facility to learn more.